Where’s the first place you go if you’re looking for reviews of a product or service you’re hoping to utilize? If you’re like most people, your first stop might be the internet. BBB research shows that you’re not alone more than 88 percent of consumers say they trust online reviews as much as personal recommendations. It can be tough to spot the real from the fake when looking at online reviews – but knowing how to tell the difference could save you a lot of money and headache. 1. 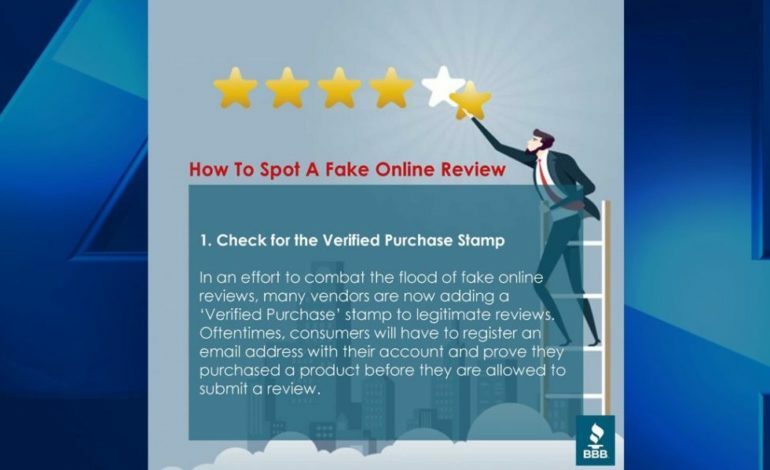 Check for the Verified Purchase Stamp In an effort to combat the flood of fake online reviews, many vendors are now adding a ‘Verified Purchase’ stamp to legitimate reviews. Oftentimes, consumers will have to register an email address with their account and prove they purchased a product before they are allowed to submit a review. This helps ensure that people who are being paid to leave reviews online have a harder time getting their fake reviews published. 2. Avoid the Anonymous Reviewer How many times has this happened to you? You read an online review that is paragraphs long and packed with details, only to find their user profile was created a week ago and is nearly empty. Sound familiar? You’re probably dealing with a paid reviewer. These freelancers are often paid to create hundreds of new accounts and leave reviews on products they’ve never purchased. If you encounter a reviewer that fits the above description, you’re best looking elsewhere for a review. 3. Be on the Lookout for Scripted Reviews Oftentimes, you can get a sense for a fake review because it sounds like the words are being scripted by someone else. Reviews that skew incredibly positive and promise you the world should send up red flags. 4. Don’t Blindly Trust Negative Reviews You might think that you can trust a negative review more than a positive one, but that’s not always the case! Some companies have taken to paying fake reviewers’ money to trash their competitors online. In other cases, the negative review may be coming from a disgruntled former employee looking to exact revenge. It’s important to take all reviews with a grain of salt. 5. Do Research Beyond Online Reviews The most important thing to remember is to do thorough research before making any purchasing decisions. In addition to checking online reviews, you should visit the BBB Directory and view a company’s business profile. When in doubt, you can always check with your local BBB for more information about a company. For more information, you can trust, visit BBB or call 812 473 0202!